It’s no secret that Skype is looking for way to make more revenue from its VoIP technologies, both in the consumer and enterprise sectors, as the company prepares for a public offering in the next year. Today, Skype is rolling out a new revenue stream—advertising. The advertising will appear in the Home tab of Skype for Windows, but will only appear in consumer versions not the enterprise versions. The company has been testing ads over the past month and will be working with a number of advertisers, including Groupon, Universal Pictures, and Visa (we are told Nokia, Volkswagon and Disney are also signed up). Ads will appear in the US, UK and Germany and initially, Skype will show an ad from one brand per day in each of the markets where advertising is being sold. Skype has partnered with Meebo in the U.S., Ad2One in the U.K., and Ströer Interactive in Germany to sell advertising for Skype in each of their respective markets. Specifically, Skype’s advertisements will be placed in the large masthead space and will be display ads that can include audio or video. 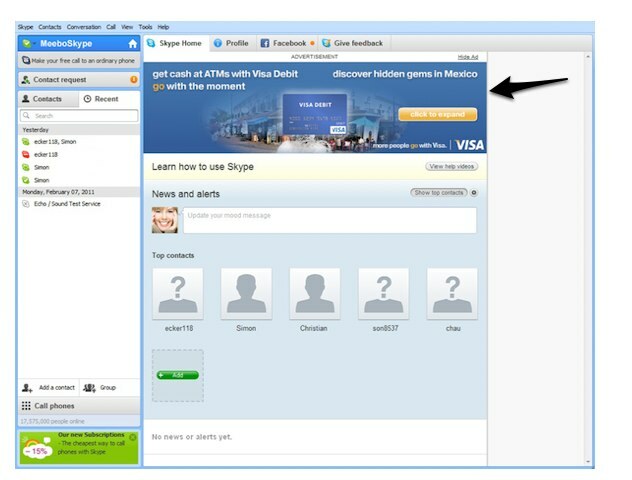 Since the ads are on Skype, advertisers can add a Click & Call button in the ad as another call to action. In addition, it allows people to share the ad to their Facebook or Twitter accounts, and with one-click, ads can also be closed with the “Close Ad” button. What’s interesting is that Skype may plan to offer highly-targeted advertising as a way to lure advertisers. The company warns that it “may use non-personally identifiable demographic data (e.g. location, gender and age) to target ads.” Users can also opt-out of this targeting. The reason Skype rolled out the advertising in the Windows Client is because this is the company’s most popular client and may extend advertising to other clients in the future. Skype currently has an enormous user base, with 145 million average monthly connected users and 29 million concurrent users at peak times. But monetizing these users is a challenge. In August, only 8.1 million of out of a total of 560 million registered users were paying for Skype’s service. But things are looking up for Skype, as seen in an updated S-1 for the company. sers and financial performance. As stated in the new S-1, Skype’s average monthly connected users have increased by 38% and average monthly paying users by 19%, from the three months ended December 31, 2009 to the three months ended December 31, 2010. Net revenues increased by 20% from $719 million in pro forma 2009 to $860 million in 2010, and Adjusted EBITDA increased by 43% from $185 million in pro forma 2009 to $264 million in 2010. Skype’s net loss in 2010 was $7 million, compared to a net loss of $418 million on a pro forma basis in 2009 (which includes a $344 million charge incurred by us in connection with the settlement in the Joltid Transaction).